Welcome to ResDiary 9.7! Try out improvements on the Stripe landing page, that make taking payments in advance even easier. 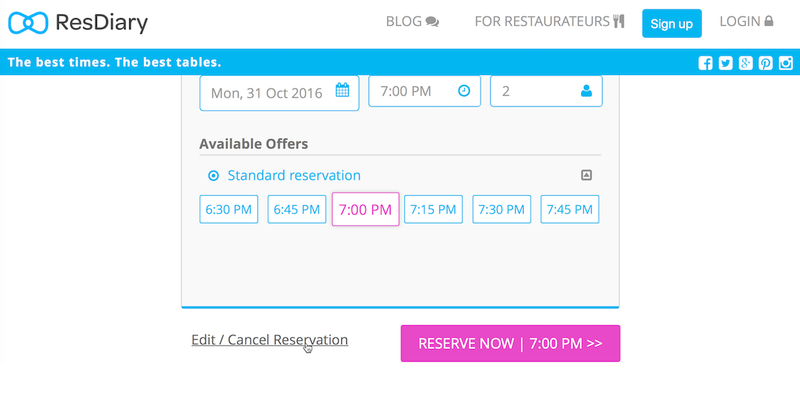 See how our new “incomplete reservation alerts” help your team stay on top of all reservation enquiries made. Discover how you can control the time period in which diners can edit their bookings before arrival and make a good impression with our new logo profile image upload feature for use with the ResDiary Now iPhone app for diners. Learn more below, including support articles and tutorial videos. Please remember to clear your cache to access all new functionality. Set the validity period for any Stripe secure payment landing page. Record your customer’s email address and send or resend a link to the payment options directly to them to process their payment. Quickly access a history of payment information for any reservation made using Stripe for easy tracking. Set your own policy on the time given to diners to confirm their booking via the secure payment landing page. Diners are guaranteed to receive the email that directs them to secure payment landing page. Your team can correctly audit the history of payments that have been added to or deleted from a reservation so they can track any discrepancies. Receive an alert on your diary screen to inform you of any incomplete reservations on the system. The “incomplete reservation dashboard” report will give restaurant managers the ability to edit incomplete reservations and archive them for future reference. Ensure that front of house users do not create ‘incomplete reservations’ by mistake and can manage these if necessary. Manage “incomplete reservations” created by diners online that have failed to submit their credit card details. Admin users can set the time period that a diner can edit or amend their reservation prior to their arrival at your restaurant. Enabling this setting means that any last minute changes or cancellations by diners are picked up by your team in advance. Direct diners to a more intuitive and user friendly edit/cancellation process. Upload an image of your restaurant’s logo into the image browser and tag it as “Restaurant Logo Phone App Image”. By doing this, you will ensure that your restaurant stands out from the crowd when being searched for on ResDiary Now – our brand new app for diners.